Larger home with room for a whole family! Easy walk to beach. 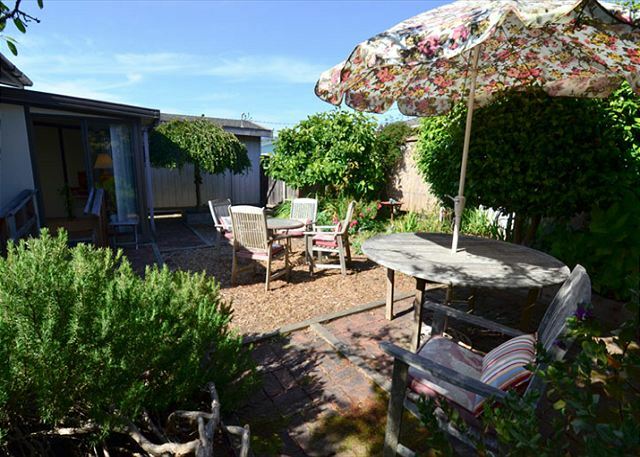 Located right in town, this great vacation house has two bedrooms plus sun room for reading and relaxation. Comfortably furnished with a small back yard for grilling and a short walk to the trail down to the beaches, restaurants, cafes, and parks, this home will be a great launching point for your Trinidad Vacation. Wi-Fi, cable tv, an eat in kitchen, dining room, sun room, living room, washer and dryer, and all of the other amenities that you'd want in a vacation home. 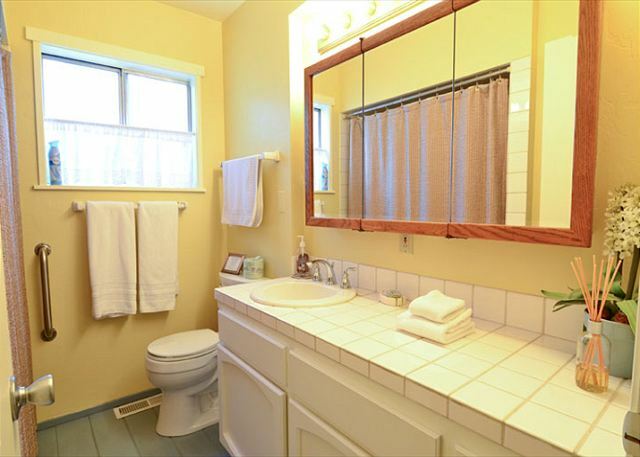 This home has a full bath and half bath. One small dog is permitted for additional fee; sorry NO cats. Located on a quiet street in the village of Trinidad which is a great central place for exploring Humboldt County and the Redwoods! With plenty of wonderful beaches, hiking, and the state Park right in town, you can have a great time without getting in the car. However, everyone loves to go to the Prairie Creek Redwoods National & State Park which is about 20 minutes north. The park has over 100 miles of incredible hikes through the Redwoods and do not forget to check out Fern Canyon, Lady Bird Johnson Grove, Big Trees, the Cork Scree Trees, and Big Tree, just to mention a few of the destinations in and around the park. The Humboldt Lagoons are another perfect destination, which can be included on your trip to the Redwoods or make a separate trip out of it, with fun fishing, hiking, beach combing, bird watching, kayak and paddle board renting, and even swimming in the late spring , summer, and early fall. Please note: We understand that Trinidad is a popular wedding location, however please do not book this house for any event or wedding celebration purpose. Even while observing the vehicle limit, we’ve still had problems with guests chauffeuring wedding party members back and forth to the beach from this house, which causes too much noise and extra traffic on the very small quiet street. This home is to be used strictly as a single family residence normally would be. Additionally, the non-smoking status of the house must also be observed on the property, so that second-hand smoke smells are not experienced by the many close neighbors. This comfortable home was a perfect fit for our needs. My father is in a wheel chair and this home was a great place to enjoy the coast for a couple of days. From the moment we rolled into town and met Dori for the face to face, we couldn't be more pleased with our stay. It was a pleasure to meet you Josh, and I am glad to hear you had a nice stay at the Trinidad Village Retreat. If a couple days wasn't enough, please visit us again! Thoroughly enjoyed stay at this residence. Spent many hours relaxing in sunroom. Walked to different local restaurant each day. Thank you for sharing that you enjoyed your stay at the Trinidad Village Retreat. This is a great home for exploring Trinidad by foot, as it is centrally located and walking distance to restaurants, wind tasting, shopping, groceries, and the beaches. The home is also quite relaxing, especially in the sun room. I am glad you had a wonderful vacation and I do hope you will return to stay with us again. I would rent this home again. This was a great experience. I was very pleased with my choice to rent Trinidad Village Retreat.This home was walking distance to everything I needed. The home was clean and very comfortable, even better than expected. My son lives in Trinidad so I will be visiting often. I plan to rent this home again when I visit next year. Thank you again. Thanks for the nice review of the Trinidad Village Retreat home. It is always nice to have a comfortable place to stay when you come to visit your family. This home is comfortable and convenient for visiting our area and if you return to stay here again, please be sure to mention you are a repeat guest, in the event we have a special at the time. Thank you again, we look forward to your return. This property was extremely clean, quaint, had the amenities that we needed for family time, and the location was ideal! To see the best of what this gorgeous region has to offer, you can’t get any better than Trinidad! We had the perfect family family and created memories that will last a lifetime!! Thank you Redwood Coast vacation rentals! That couldn’t have been any easier to work with, or more accommodating! We would stay here again in a heart beat! Forever grateful and thankful! What a wonderful review. Thank you! Nice comfortable home. It has it's quirks, but all in all we enjoyed our stay here. It is just a 30 second walk from the bluffs, which we loved. 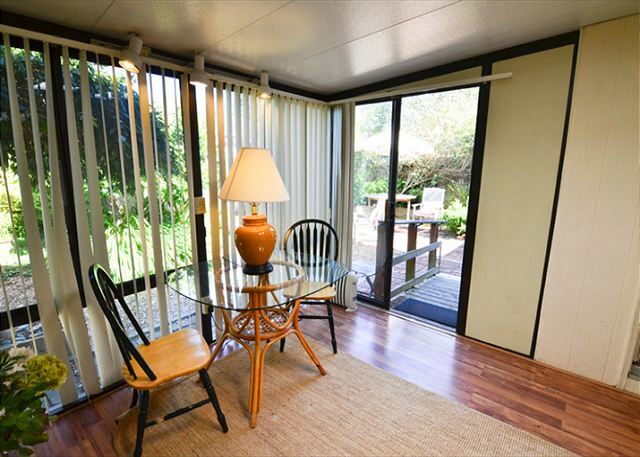 Yes, this is an older home with some quirks to it, but the Trinidad Village Retreat is a great base location for those seeking to explore the redwoods, parks and beaches, while also being walking distance to town and all its amenities. I am glead to hear you enjoyed your stay here and we hope we will have the opportunity to accommodate you again in the future. Our stay was very pleasant. The location was walking distance to restaurants (though we only stopped at the Beachcomber Cafe-recommended), beach area and groceries. The home was clean and well stocked. Loved the small sunroom. It fit our family perfectly! It always makes me feel good to hear that a home is a good fit for someone. The Trinidad Village Retreat is simple home in a great location. Walking distance to most all of Trinidad, making it very convenient for those visiting the area. We are glad your stay was pleasant and we welcome you back anytime. This was our second visit to Trinidad Village Retreat in the past year. The weather was not as agreeable as before but we did enjoy sitting in the Sunroom and watch the hail and snow come & go. We also enjoyed a delightful dinner at Larrupin the night of our arrival. It's our favorite spot when we visit Humboldt County. 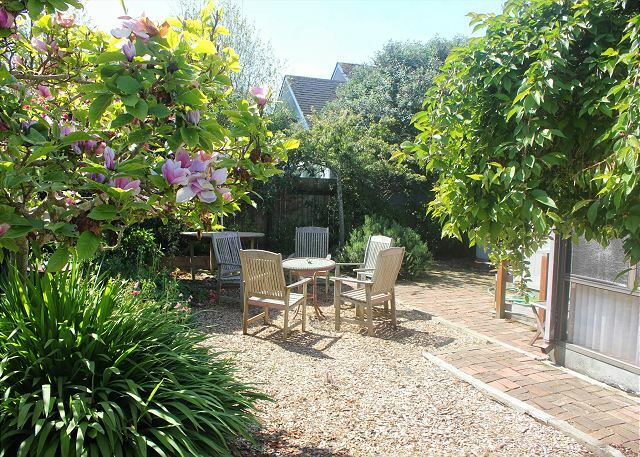 The house is only a block from the village and a pleasant walk to the beach and lighthouse. The fenced back yard is also a plus if you're traveling with a pooch, as we do. We hope for a return visit in the not too distant future. Thank you for being a return guest to the Trinidad Village Retreat. We definitely had some unusual weather this year, and it sounds like you made it work for you. This is a perfect home for those who wish to travel with their pet. We will be updating the backyard soon, so hopefully you will return again to see the changes. As always, we appreciate your business and look forward to accommodating you again. Thank you for your stay at the Trinidad Village Retreat. This home is in a very quiet neighborhood, in quite the central location for walking all over Trinidad. We are pleased that you found it a great place to stay for your visit. Thank you for choosing the Trinidad Village Retreat and for booking with Redwood Coast Vacation Rentals. We hope you enjoyed your stay with us! I have used this rental in Trinidad over the years many times. It is a nice option for the area and works out well for me as I travel with my dog. The home is spacious, the rooms are average size..more than adequate for my needs. But, the master is not extra large like some of the newer homes, again not an issue for me. Bath has tub and shower, lots of hot water...I enjoy using the wood stove, in the warmer months, the sunroom and beautiful outdoor space are wonderful. 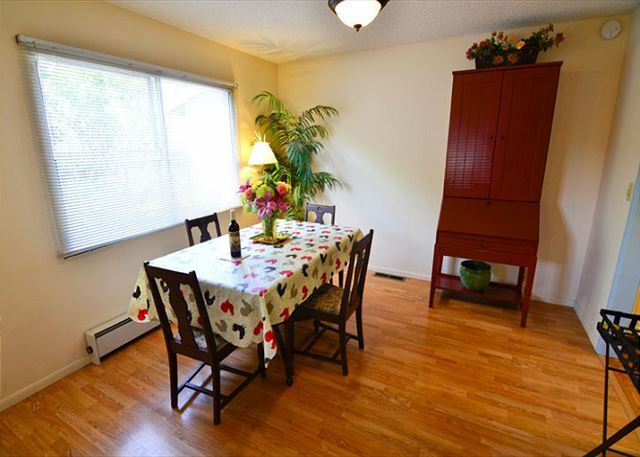 It is a home away from home with laundry facilities, large kitchen, two dining tables, etc. Parking is a bit tight (space for 2 average size vehicles). I have a mid-size SUV (4runner) and I fit fine. If you gave a heavy duty truck or similar, it might be tight. This is a reflection on the town of Trinidad not this home or rental company, Trinidad is a small city with parking restrictions. Redwood Vacation Homes always offers great service. If there's a problem, I have always reached them quickly. Extend my stay? No problem. Great customer service! And they always provide local coffee and treats which will get you through till you can make it to the store. I recommend this property and Agency. Thank you for being a repeat guest to the Trinidad Village Retreat. We are happy to be able to accommodate you and your furry companion when visiting our area. It is always a pleasure seeing you and we look forward to having you with us again in the future. Overall, the unit is great. It is well kept and is very spacious. There is a sunroom and patio, but since it rained during our stay, we didn't have much use for it. The unit comes equipped with a washer and dryer, and plenty of towels. There is a dishwasher, but we didn't use it for more than holding the dishes we washed. All appliances are up to date and there are enough dishes for a group of 4 - the max the unit allows. The beds are comfortable and linens are provided. There is a heater, and as well as a wood burning stove. 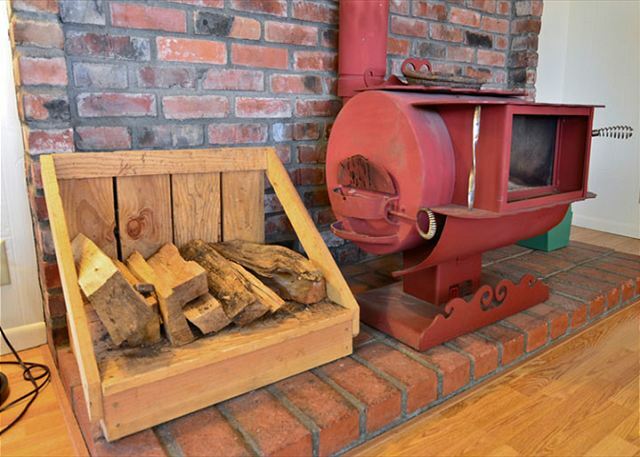 You probably will want to turn down the heater when you use the wood burning stove, because surprisingly it heats the house well. You have off street parking, enough for two cars. This unit is located in a great place; the little town of Trinidad has food, a casino, and attractions -- there is much to do in the area. The neighborhood is quiet, and welcoming. Be sure to stop at the nearby eatery which is literally 5 minutes walk from the unit. It is really close to the highway and is right in the middle of the Humboldt area. You are literally 10 minutes drive from Patrick's Point, and if you drive an hour out north, you will be able to reach Klamath area; and if you drive an hour south, you will be able to reach the beginning of Avenue of the Giants. I recommend this property because of all of it's amenities and location. Thank you for the very thorough and wonderful review, not only of the Trinidad Village Retreat, but of the area. This is a very popular home for those visiting Trinidad and the Redwoods due to the location and proximity to so many scenic sites our north coast has to offer. The house has all the amenities that most homes have, and the walking distance to most all of Trinidad makes it very convenient. We thank you so much for staying with us and for booking with Redwood Coast Vacation Rentals. We hope you will stay with us again. We had a great time in quaint little Trinidad. Never having been there, we lucked out on both the rental house and the location. Great little town with everything within walking distance-only a few blocks to shops, restaurants, stores,activities. Trinidad Village Retreat is such a great place to stay while visiting Trinidad. I am so pleased to hear you had a wonderful time, both with the home and location. Its convenience does make it a popular home for repeat guests to Trinidad, and I hope you will return to visit us here at Redwood Coast Vacation Rentals, and Trinidad, again. We stayed here for a week. The place was perfect for 2 adults and our 2 grown children. It was wonderful to also be able to bring our family dog. The house was exactly as pictured but seemed larger due to the floor plan. It was probably built in the 60s so not modern, but very cute and practical. It is in a great quiet location. Easy to walk to restaurants, shops, hiking trails, the beach and the market. A short drive south to Eureka and breweries. A short drive north to the redwoods. We will definitely stay here again. Thank you for the review and we look forward to having you as a return guest to the Trinidad Village Retreat. This is a great family home for everyone, including the family dog. Great location, walking distance to everything in Trinidad from the store, post office, gift shops, dining, and beaches. We can't wait to have you back! Everything was what it should be in this cozy, spacious, well-equipped house. It was incredible to be minutes from the cliff to view the ocean and a short walk down to the beach. The Home was perfect for our stay. The kitchen was more than sufficient and we enjoyed having with the grill and patio for our meals. What made this stay especially fine was the management which was highly professional and courteous. It was just a pleasure to stay here and take in the beautiful sights! The Trinidad Village Retreat is a great home for visiting Trinidad and walking distance to the beach shopping and redwoods. Thank you for choosing this home and for booking with Redwood Coast Vacation Rentals. We hope to see you again. Nice home, roomy and so convenient to be able to walk around town. I enjoyed everything in Trinidad! I would definitely stay in this house again. As for location, this home is definitely in one of the best locations in Trinidad to be close to everything by foot. I love Trinidad and I love to hear that others enjoy it, too. Thank you for booking with Redwood Coast Vacation Rentals and we do hope you will return to stay with us again. We really enjoyed our stay here! The home was perfect for our family of 2 adults and 2 kids. It was spacious, nicely decorated, kitchen very well stocked, plenty of towels/blankets etc. Sunroom at back with view to garden was great! Lots of extras too, like gas grill, pamphlets/info on area, jigsaw puzzles for kids etc. We'd definitely stay here again. Thanks you for the very nice review. The home is definitely a lovely spot to stay in Trinidad. It is in such a convenient location, and has plenty of stuff around the house to do. We do hope you will return to visit us again. Thank you for choosing Redwood Coast Vacation Rentals. Awesome stay at Trinidad Village Retreat!! This was my second visit to Trinidad, CA a village that has become a favorite destination. This property was very nice and much larger than expected. The location was extremely convenient for walking to shopping, dining, wineries and hiking. The staff, Dori, Staci and others were great to help if needed. I look forward to staying at this or other properties on our next visit to the Humboldt area. Thank you for choosing the Trinidad Village Retreat. 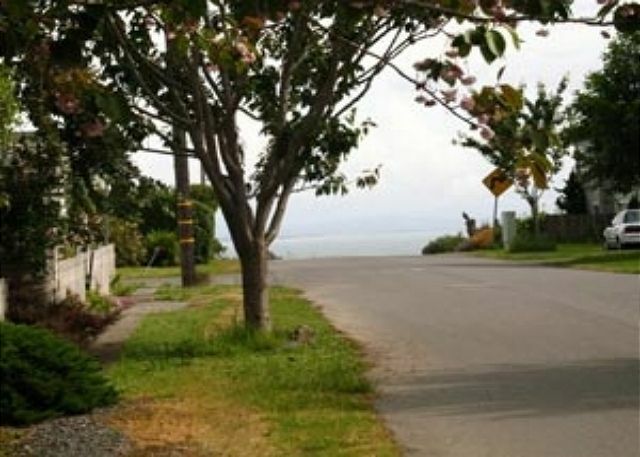 This is such an ideal location to be able to walk all over Trinidad, and yet be close to the redwoods by car. Thank you for staying with us and for choosing Redwood Coast Vacation Rentals. Our stay was just fine, so close to beach and nice and quite. It was a little far from Eureka. Thank you for staying at the Trinidad Village Retreat.We do have many homes within the Eureka area that may have been better suited for you. In the future, please call us directly so that we may better able to assist you in finding a home that is the best fit for you and your family. This is a great place for a family with their pet. THe backyard and sunroom were perfect to sit out and enjoy the sun. The living room was very spacious and comfortable to relax and visit with family. Trinidad Village Retreat is a great home for family travel with a pet. I am glad the home worked well for you and was comfortable. Thank you for staying with us and we hope you will visit again soon. Thank you for choosing the Trinidad Village Retreat. This is a great centrally located home, close to so much in Trinidad. Redwood Coast Vacation Rentals thanks you for your stay and we hope we can accommodate you again in the future. Great location for all the things we wanted to do in the area. We loved the small, quiet town of Trinidad. Fun, gorgeous hike in walking distance from the house. The Redwood Coast staff was friendly and quick to respond for minor help we needed. Four stars only because the home is dated but it had everything we needed. Thank you for the review of the Trinidad Village Retreat. This home is in a great location, so glad it worked out for you and your family. The overall rental experience was great. The smart phone app made it very easy to check in and check out and quickly obtain useful information on the house and local area. When arriving at the house, we were very pleased with the location and condition. We were greeted with a tasty local beer in the fridge and a box of cookies, making our arrival very welcome. The house was very comfortable for our family of 4. The living room, kitchen, and dining areas were spacious and the sun room was beautiful during the day. We walked to the beach and local restaurants and spent a day at Patrick's Point State Park. We really could not have asked for a better location. Our only complaint with the house was the odor. The house had a very strong wet dog, musty smell. We ended up buying air freshener spray that helped. The house was pretty clean, although it was quite dusty under some of furniture. Overall, we had a great time and would consider returning to this house and will definitely consider using Redwood Coast Vacation Rentals again. The service was incredibly easy and professional. Thank you for the thorough review of the Trinidad Village Retreat. Your feedback allows us to improve our job, so it is much appreciated. This home really is in such a great location for Trinidad. Easy to walk to just about anything you may need. I am glad the app was useful to you. We have been transitioning into it and hope to develop it even further. Thank you again for booking with Redwood Coast Vacation Rentals and we hope you will return to visit us again. This was such a great rental. We felt so welcome with all of the little details (chocolate treat, dishrags and soap, etc). It was comfortable, good beds, clean, and well kept up. The fireplace was a nice touch for the cold rainy weather. It is always good to hear when a guest has a good experience at a home. Trinidad Village Retreat is the perfect place to feel at home and comfortable. Thank you for booking with Redwood Coast Vacation Rentals and we hope to see you again. Our stay was great for us having a reunion with a Montana sister and her husband. Loved the trail on Trinidad Head and highly recommend eating at Sushi Spot in Arcata or McKinleyville. Home was comfortable and located in a quiet neighborhood and close to grocery store. Weather was cold and so we used the heater, but it kept failing after a while. Wood stove nice but couldn't heat entire house by itself. Property manager is arranging for a service appoinment for the heater. We'll be back! Thank you for your recent stay and I was sorry to hear of the heater issue. The heater was repaired yesterday and should be good to go for any future visits. I thank you for your patience and for leaving the home so tidy for us. We look forward to your return stay. The house worked out well for our family. It is in a great location in Trinidad - you can walk to the grocery store or to the restaurants (the Beachcomber cafe has great pastries for breakfast!) and here are great views and trails along the coast just down the street. The house had pretty much everything we needed. Only real issue was that the bedrooms were a bit chilly (we are from AZ so not used to that). We would stay here again when in town visiting family in McKinnleyville and would recommend this house to others. Good to hear that the Trinidad Village Retreat worked out well for you and your family. The location makes this home popular to stay in. We hope you will return to stay with us again. Thank you. and the back yard was great for the dogs. We highly recommend this rental and look forward to returning. Glad to hear that the Trinidad Village Retreat was such a good fit for you. This is a popular home in Trinidad due to the location and proximity to so much in and around Trinidad. Being able to have your fur family with you, too, is such a plus. Thank you again for choosing Redwood Coast Vacation Rentals and for staying at the Trinidad Village Retreat. We look forward to having you back again. This home was in a great location and was more than enough space for my family of five. I am glad to hear that the Trinidad Village Retreat was a good fit for your family vacation. Thank you for booking with Redwood Coast Vacation Rentals and please visit us again soon. The Trinidad Village Retreat is a great home, centrally located in Trinidad that is walking distance to so much of the town, beaches, and dining. Makes for a great resting spot when visiting our area. Thank you for your recent stay and we hope you will stay with us again. Clean home with a comfortable bed in beautiful Trinidad. Walking distance to everything in town and the beach. Wish the fridge and furnace weren't so loud at night. Thank you for your recent booking at the Trinidad Village Retreat and for your comments about the fridge and furnace; we will look into it. We hope you had a nice stay and will come visit us again. This home was much bigger than we needed for 2 people but we didn't mind. Plenty of couches to lounge on. The internet was speedy and the cable had all the right channels. We had a minor problem with the tub but a quick text to VRBO had it fixed the next morning while we were out hiking. The location in Trindad couldn’t be better with a market and restaurants all within walking distance. We wouldn’t hesitate recommending this property to friends. I am pleased to hear that the Trinidad Village Retreat was a good fir for you while exploring Trinidad and the north coast. This home has the basic necessities, while also being in such a convenient location for adventuring in our area. Thank you for staying with us and we hope you will visit again. We had a great time in Trinidad! We had a great time working on a puzzle in the sun room. The kitchen was well equipped so we did a lot of cooking. Buy fish at Murphy's! The bed was very comfortable. We hope to stay there again next summer. Trinidad is great isn't it! Thank you for booking the Trinidad Village Retreat. Murphy's market has a great fish market inside and I am glad you found the kitchen well equipped and were able to enjoy cooking there. I have to say, I do enjoy the sun room and the thought of sitting in there working on a puzzle sounds quite relaxing. Thank you again for staying with us and we can't wait to see you next year! My family loved staying in Trinidad. The house was walking distance to trails, beaches, restaurants, and the grocery store. Very convenient! The house was clean and cozy. Thank you. Thank you for booking the Trinidad Village Retreat for your family vacation. Trinidad is such a lovely town, I am glad you enjoyed your time here. This quaint cabin has everything you could need and more! 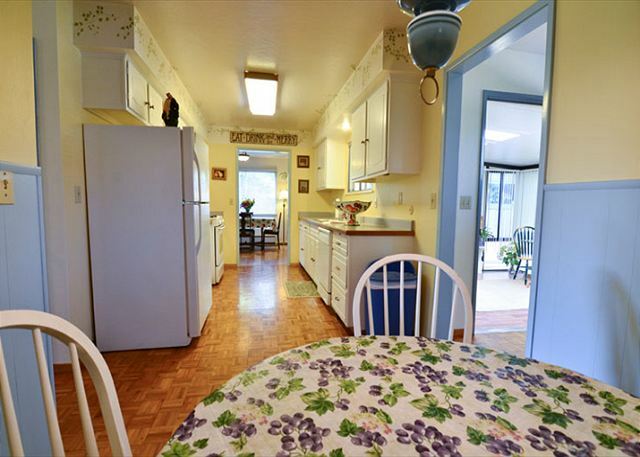 I expected the 2 bedrooms and 1 1/2 baths, but the pictures don't give the full effect of the spacious dining room, living room, sun room, and kitchen...not to mention the patio area in the backyard. I even enjoyed assembling a jigsaw puzzle one misty morning while sipping my tea. Couldn't ask for more! I loved the clean, well-equipped cabin, and I also loved that it was walking distance to the ocean, beach, grocery store, art galleries, restaurants, and wine tasting! In addition to Trinidad itself, the location is convenient to exploring Redwood National Park--the primary purpose for my vacation here. It was an easy drive to see the tall trees, drive through a tree in my car, and most importantly, hike through the Redwoods. Thank you for this lovely home away from home! Wow! What a great review! Sometimes I read a review and wish I was with the guests on their vacation; we live in such a wonderful place and I am glad you were able to enjoy it so well. This home is cozy and comfortable and most of all, it is in such a great location for vacationing. Thank you for staying with Redwood Coast Vacation Rentals and please visit us again soon. Overall: Wonderful vacation there. Would not hesitate to stay again, especially if the problem furniture is replaced. Far from luxurious accommodations, but excellent for the price. The positive: The living area of the house is spacious, the kitchen is clean and very well-stocked with dishes, pans, utensils, etc. Bathrooms were clean; linens were adequate, excellent water pressure in shower, great heat lamp. Sheets/blankets adequate. Fabulous location! 1 1/2 block walk to the end of the street and a stunning view. Short walk to the beautiful harbor and beach, grocery store, coffee house, restaurants. Lovely, picturesque little town. Improvements needed: Furniture and decor could be improved re: style and comfort. Rocking chair in the living room is cute, but not usable, easy chair in the corner not comfortable. Area rug had pet hair embedded in it - need more powerful vacuum or more attention to removing pet hair. The power-lift chair in the bedroom has a terrible odor (urine and mildew) and should be professionally cleaned, or better, discarded altogether - didn't want to sit on it even to put my shoes on. The twin bed nearest the window was comfortable enough, but the twin bed against the wall was un-sleepable - terrible mattress or box spring or both. Should be replaced (good thing that there was only 1 person sleeping in that room - 2 would have been a problem with only 1 usable bed). Queen bed in the other room was fine. Thank you, to the owners, for providing a reasonably priced and very decent home for a lovely get-away. Thank you for the open and extensive review of the Trinidad Village Retreat. While each year we have focused on different aspects of the house to improve, I immediately began working on the furniture upon reading your review. You will be happy to know we have found a replacement for the power-lift chair and are working on revamping the house piece by piece. Thank you for your feedback and I hope you will return to visit us so you can experience the changes we have made. Thank you for booking with us and hope to see you again soon. Very homey and comfortable. Lots of space to hang out with your family. Nice welcome touches by property managers. Thank you for your recent stay at the Trinidad Village Retreat. So glad you had a nice stay. Please visit again. Very clean, Way too much room/beds for the 5 person limit,(it was 8 few yrs ago) a slightly larger family would have to miss this very nice home. We have been renting it, a week in June, for 6 or 7 yrs. The newest managers have fixed any little problems the place had, (front door handle was a knuckle buster) better key access, ect. and are very nice. Same for the cleaning staff, we met last yr. Three ways to warm, including the wood stove, woods provided. Walking distance to beaches, or market, is a few blocks. Is small pet friendly. Eat at Larrupins. Stop by Sea Around Us on Main St Trinidad, very nice staff their too.... :) Buy local, & hit the farmers markets in area. Thank you for the review of the Trinidad Village Retreat and thank you for being a repeat customer to this home. Slowly but surely, we are definitely trying to make improvements to the home the best we can between guests. I consider this home to be one of the most conveniently located homes for visiting Trinidad, and you pretty much outlined it perfectly in your review. Thank you so much for staying with us, and we look forward to having you back again. My wife, myself and our two Golden Retrievers spent five pleasant days at the Village Retreat. The house was perfect for our needs, including the private, fenced backyard. Being only a block and a half from town and the beach, the location was perfect. Also a very quiet neighborhood added to our enjoyment. Dinner at Moonstone and Larrupin is a must for any visitor to the area. A sunset at Moonstone is a real dining treat. The only addition that would have been appreciated is an outdoor light in the backyard. We hope to return in the not too distant future. Thank you for your recent stay at the Trinidad Village Retreat. What a great location to be for visiting Trinidad and being able to have your furry family with you. Larrupin and Moonstone are two of my favorite places; so glad you were able to go to them and enjoy the wonderful dining we have in Trinidad. Also, thank you for recommending an outdoor light in the back; I will see if I can get that scheduled soon. Hope you get a chance to visit us again soon. Thank you! The location was perfect and the accommodations were wonderful. Some things were a bit dated but, all in working order. Trinidad Village Retreat is a little dated, but very much has that home atmosphere. We look forward to some updating this year and some more current furnishings. We do thank you for your recent stay and we hope that you will return to Redwood Coast Vacation Rentals again. Overall we really enjoyed our stay in this home. While it is older and in need of some work it covers all the basics needed for a short stay. The property manager told us some of the house was going to be updated soon after we left. The best part really is the central location. Everything in the village is in easy walking distance. Grocery store and restaurants are right around the corner. Wine tastings are steps away including our favorite, Moonstone Crossing. Two blocks away is an amazing vista overlooking Trinidad Bay. We recommend the drive (or long walk) to Laruppin for the best meal in the area. Mostly we loved the easy access to Redwoods NP where we hiked daily. We didn't have any problems with the temperatures at night though there were lots of noises from the house. While there was plenty of bedding and towels it was not the nicest I've used. Everything worked even though things were a bit older and worn. Hardwood floors were nice as was the wood stove (but not any fire for viewing purposes). To me the property description was a little unclear as we expected a fourth proper bed and there were only three - one queen and two twins. The pullout was OK but not as a good as a bed. The one shower was a bit awkward to use but it got the job done. Finally I must give props to Redwood Coast Rentals. They were extremely professional and active throughout the process. We contacted them about some minor concerns during our stay and they responded right away...even during a major holiday. Our property manager was very friendly, helpful and understanding. A different property manager we inquired during our planning didn't even respond to our messages so it makes a huge difference. Thank you for staying with us and glad that you enjoyed your stay. We work hard to be responsive and it is wonderful that we were able to work with you when you were planning here trip here. Hope to have you back soon! Over the moon customer service!! A couple of the most popular things about the Trinidad Village Retreat is that it is in such a convenient location and it is such a casual house that it really feels like being home. We are glad to hear that it worked well for you and what a treat it is to walk out in your pj's and enjoy the views. Nothing like being and feeling like on a vacation. Thank you for your stay and we do hope you will make it back to visit soon. We have some home improvements coming up soon in the house, I hope you will notice the changes. Thank you again for your stay! The stay was great! Everything needed for a relaxing stay on the redwood coast. Redwood Coast Vacation Rentals thanks you for your recent booking and we do hope you will return to stay with us again. Overall our stay in Trinidad was excellent. The location of the town was perfect for all of the activities we wanted to do in the Redwood National Forest and surrounding area. The rental was adequately supplied with kitchen and bath essentials. The gas grill was rusty so if you are planning on grilling out, make sure to bring some tin foil. It was also well within walking distance of everything we needed. Be sure to try a mashed potato cone at the Lighthouse Grill! So glad to hear your stay in Trinidad was excellent. The Trinidad Village Retreat is a great basic home for those visiting the area. I will have someone take a look at the grill, some replacement parts sounds like is in order. Sounds like you enjoyed your time in the Redwood National Forest, and I hope you will get the chance to visit us again. Quiet neighborhood, how easy was clean and filled our needs nicely. 3 blocks to grocery store and small shops. 4 blocks to beach, 2 blocks to bluff view of ocean. We loved it! Thanks, Amy! Trinidad is a great town for families and adventure! Please come again! Thank you for your stay at the Trinidad Village Retreat. We hope to see you again! My daughter and I stayed a week and had a wonderful time. The location was perfect. Love the small community. House was clean and very comfortable. I really liked that it had a washer and dryer. Mom and daughter trips are the best! So glad you had a wonderful time while staying at the Trinidad Village Retreat. I hope you two will return to stay with us again! 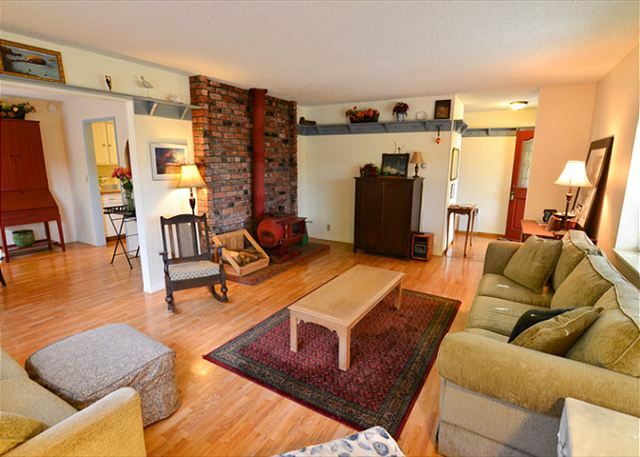 A great location, short walk to beaches, short drive to Patrick's Point. Cozy, & clean. Great place/area for family, or friends vacation. Try Larrupin's Café for dinner. Charter a fish/crab trip with the Toni Rae 11. Thanks for the review, Gwen. 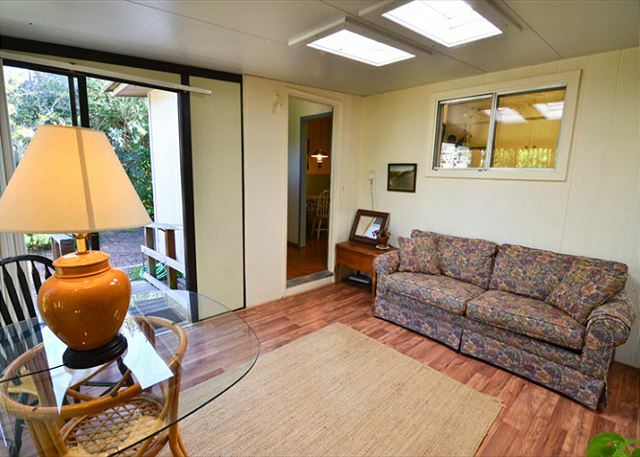 Trinidad Village Retreat is a great, cozy family home, in walking distance to most of Trinidad. Sounds like you ate at my favorite restaurant, the Larrupin Cafe. A definite must to go to! and a charter, too. Sounds like a great trip to me! Redwood Coast Vacation Rentals thanks you for your stay. I hope you will get the chance to visit us again. Maybe in one of our other completely different homes, for a different experience. Great location close to breweries and outdoor activities and centrally located in Trindad. It's quirky and eclectic but overall was a wonderful place to stay. If you are looking for a "high end" vacation rental this is not the place for you, but if you like a more relaxed, laidback place to stay - then check it out. The dishes don't match and the furniture is mismatched but if you want to just relax, have a drink and put your feet up, then you will feel right at home. Thanks for the review of Trinidad Village Retreat. This home is exactly as you describe, it is a casual home, perfect for kicking back and relaxing. The accessibility to most of Trinidad is such a plus for this home. Thank you for staying with Redwood Coast Vacation Rentals, and please visit us again. Relaxing. I never did receive a receipt. That would be the only thing I would like. Thanks for having a relaxing time at TVR! Please come again! Your reservation receipt is automatically sent when you book. We had a great time..house was great & centrally located. Thanks for enjoying the Holidays with us! Will we see you next year? 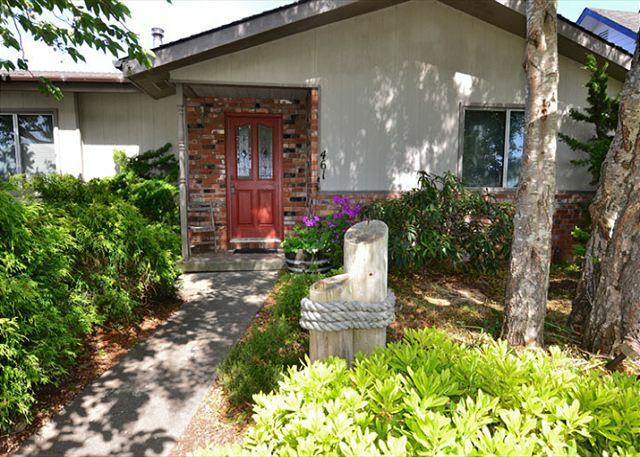 We have plenty of room for everyone here at Redwood Coast Vacation Rentals with our 60+ properties available throughout Humboldt plus Crescent City and Willow Creek! The house, town and community are warm and inviting. We will be coming back in the Fall. The Property Mgt Team is very accommodating. Can't wait to return!! Thank, Teresa! We hope to see you again next fall! You have been a great renter! We rented 461 Ocean Ave for 3 months and LOVED the experience of living in town. The house is very comfortable and accommodating. The location is ideal. Hope you enjoy it the same! Thanks for being such a great guest, Teresa, to you and your whole lovely family! I may take you up on one of your Costa Rica vacation rentals in the future!! We are happy you had a lovely time. Please visit Trinidad Village Retreat with Redwood Coast Vacation Rentals or one of our 50 other properties in the region for your next vacation destination! Overall the Trinidad Village Retreat was wonderful. The coffee maker died the first morning of our stay, but alas there is a fine coffee house a very short walk away. Also there was scheduled road work right in front of the property so our egress/ingress was limited and we were forced to leave the property promptly for our daily adventures - first it was tough to pull out and second the noise and vibration was unbearable. The roadwork was not directly the owner's fault but there was no warning until we arrived. We had some non-early risers in the group so it made for unhappy campers. This house is central to all the places we wanted to go: Fern Canyon, Orick, Redwood State Park, HSU, Samoa Cookhouse, Loleta Cheese Factory, Ferndale, etc. During our walk from the house we realized HSU Marine Biology Department had a visitor's area in their working facility... very cool! A great location if you love the beach and the redwoods! Great news! The coffee pot has been replaced! (Wish you would have called us right away!) That road work is almost done. The city is putting in a new environmental drainage system for the storm drains and the work is almost completed! Thank you for your patience and finding great thing to do during your stay! We have rented the Ocean ave. house for a week in June for the last 5 years. We love the quiet neighborhood, the comforts of home & walking access to all the attractions in Trinidad! We highly recommend renting your vacation Here! Thanks! We love having you year after year and we will see you next year! Thank you for choosing Redwood Coast Vacation Rentals! We had a great time. Property management was very helpful. My husband even caught a couple of fish right down at the beach ( which is just a short walk away )! The house was clean and comfortable. Thanks Andrea! Great times for your husband and his catch! You came when the trees are blooming and the street out front is covered in pink. . Please come see us again at the Trinidad Village Retreat or any of our 50 other properties with Redwood Coast Vacation Rentals. This place was great in all aspects. From the person who managed the rental, the fresh flowers and wine, the location, the wood stove and well...everything. We were so happy staying there that I am sure that we will be back. It was more than expected! Thank you! Thanks, Tina! I expect you back soon now!! Trinidad Village Retreat is a great location, central to all Trinidad has to offer and within walking distance, too! With the rainy weekend, the nice wood stove is quite a treat. See you soon!!! They were very accomodating and helpful. The house was very comfortable. I loved the wood burnibg fireplace. Thanks, Scott. We are glad you had a nice time and the house was comfortable. You received a nice write up in the local paper, too! Perfect location when visiting the Redwoods! The beach is also the most beautiful beach we saw the whole trip. It is very quiet and restful setting to spend time. Next time we want to stay longer! Great location! Cute house with amenities and easy access to the parks. Also appreciated all the handouts / maps available in the living room. Thanks for letting us know that the maps and handouts were useful to you. We hope you come back to Trinidad Village Retreat to find a location on those maps that you didn't quite get to on this trip! Visit us at Redwood Coast Vacation Rentals or any of our other 50 vacation rentals on the Redwood Coast and Rivers. Decided to bring my dad to the town he loves best for his 50th. I am so glad we found this house. It was clean, perfectly located for our activities and well equiped! He said it was a birthday he'll never forget. Mission accomplished! Thank you Redwood Coast for everything. We'll be back soon!! Beautiful! Hope to have you back to the Trinidad Village Retreat in Trinidad by Redwood Coast Vacation Rentals or one of our other 50 vacation homes in the area, including Trinidad, Arcata, Eureka, Orick and the Prarie Creek Redwood National Park, Crescent City & now Willow Creek on the Trinity River! appliances, soaps & dishwashing liquid & pods for dishwasher. It is a very nice touch walking into fresh flowers & complementary bottle of wine to start our vacation off Right:) Thank you for another successful vacation! We are ready to Book next June. We do try hard to respond to guest recommendations for improvement. Glad you noticed! We will see you June 2014 at Trinidad Village retreat by Redwood Coast Vacation Rentals or any of our other 50 vacation rentals on the Redwood Coast and Rivers. Best Value in the Village! Private, relaxing retreat right in the middle of the village. Adorably decorated in a beach vacation theme with a mix of furniture styles. Comfy couches, soft beds, lots of linens and towels, fully stocked kitchen providing everything you need. Extra touches like the fresh cut flowers, complimentary bottle of wine, and interesting books were welcoming. Two separate bedrooms, one queen room and a room with 2 twin beds, large living area (TV a bit small to see from couch across the room), dainty antique dining set in dining room that didn't appear sturdy, smaller dining table in breakfast nook - perfect for kids - and our favorite, dining in the sunroom. We had most of our meals in the sunroom overlooking the lush landscaping in the private back "courtyard" - ideal for traveling with dogs. It is fully fenced, has a brick patio with outdoor seating, BBQ area, and is a lovely spot to soak up some sun. The house is only about 4 lots up from the harbor and is a very short walk (about a block) to the lighthouse, Moonstone Wine Tasting room, Beachcomber coffee shop, and shopping at Murphy's (a must!). Several blocks away is the fishermen's pier where you can watch the commercial fishermen or eat at the Seascape Restaurant. Try the grilled rock cod or halibut in garlic and mushroom wine sauce - delicious! Then stroll over to Indian Beach to watch the sunset - just gorgeous! A short drive south on Scenic Dr. takes you to several other breathtaking views and sites not to miss like Wedding Rock, Houda Point, and Moonstone Beach. Moonstone Grill offers a very romantic atmosphere for upscale dining and watching the sunset. Going north from the village is another good restaurant, Larupin Café, Patrick's Point (not dog friendly)and Big Lagoon (very dog friendly). Thank you for your detailed review - will be helpful for others and really glad you enjoyed the Trinidad Village Retreat by Redwood Coast Vacation Rentals and hope to have you back here or one of our other 40 plus homes in the area. Comfortable, clean and relaxing vacation home. We loved this home which had all the amenities to make our stay very comfortable. We loved the fully stocked kitchen, the outdoor patio and grill and the cleanliness of the home. Would highly recommend! Thank you so much for your nice thoughts about the Trinidad Village Retreat! We just painted most of the interior as well and it really adds to the warmth. Hope to see you again at one of our 40 homes by Redwood Coast Vacation Rentals! Perfect vacations is our goal! 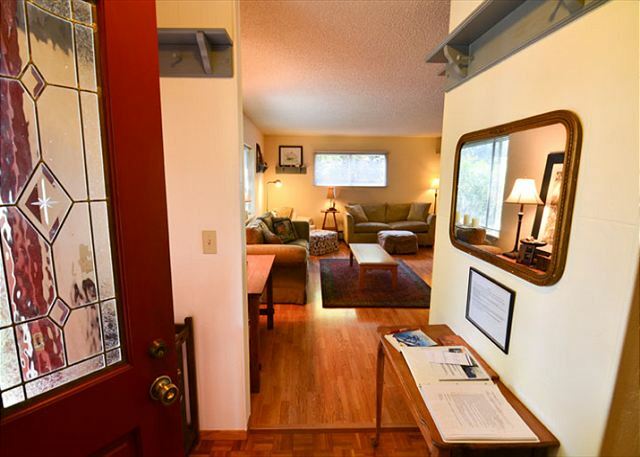 Come on back to Trinidad Village Retreat by Redwood Coast Vacation Rentals or one of our other 40 homes in the area! This was a perfect place for our little get away. Located close to the beach and store made it very conviant. We traveled and saw all the sights up and down the coast. We enjoyed having a comfortable place to end the day with a warm fire and family board games. Only thing I would suggest is some cookie sheets and measuring cups. My children wanted to make cookies and there wasn't any available. I ended up buying a pan at the local store. My family and I hope to return again and I'd recommend this place to anyone! Really glad your family enjoyed the Trinidad Village Retreat from Redwood Coast Vacation Rentals. Cookie sheets and measuring cups a good idea. Will look to get some. Look forward to having you back. We were very pleased with the rental! The view is awesome! My only very minor complaint was that there was no extra wood in shed for the fireplace but we grabbed some from our house so it wasnt a big deal. Everyone was very happy to get it of town and relax for a few days. We are so grateful to everyone at Trinidad Retreats! We loved our vacation rental. The house was very charming and large. The location was perfect;we walked to the pier everyday. The kitchen was perfect for making Thanksgiving dinner! We loved our experience, it was very memorable. Thank you! We were on a hunting trip in the nearby mountains from dark to dark, and coming "home" to this rental was a welcome relief. It was clean, comfortable, and had all the amenities of home. Wow! Sounds like a lot of fun! I hope your hunting was successful! It must have been nice having the fireplace too when you returned to warm up. Had a great time on the coast. Lovely house and great cool weather. Just what we needed. Only one problem; the lock box would not cooperate. Yes, sticky lock box. Will have to replace. Glad you and your friends enjoyed the Trinidad Village Retreat. This was a nice home to stay in, very big for the price, and location was great, close to everything. We try to offer good value and I'm glad the Trinidad Village Retreat worked for you including the nice locaiton. Thanks so much...we'll be back! Loved every moment. The combination of giant redwoods, pristine (but cold) beaches, lovely walkings paths and the cool temperatures gave us a week in heaven. Thank you for being pet friendly. Thanks so much for everything...we'll be back! Trinidad was the perfect place to stay while visiting the Redwoods. Would book with Redwood Coast Vacation Rentals anytime! The staff was very accomodating. My wife loved the house and the short walk to the beach! 3rd yr staying there,has always been great. Keep on coming, and catching those salmon! The house was nice and comfortable with a beautiful garden. The location was amazing--we walked to 3 different beaches! I fell in love with the town. Everyone was super friendly. We liked the harbor cottage best of all. Great to hear. It was really nice meeting you guys as well and it did some like your were relaxing and enjoying. We have rented this house for a little while and have thoroughly enjoyed our stay! Wonderful community, lovely neighbors and close to everything! Thank you for sharing this home! Very comfortable and quiet! Thank you so much. Great to have you in our neighborhood! This house is very charming and has the sweetest garden. Our whole family has enjoyed our stay! The central location made finding thing to do easy also! 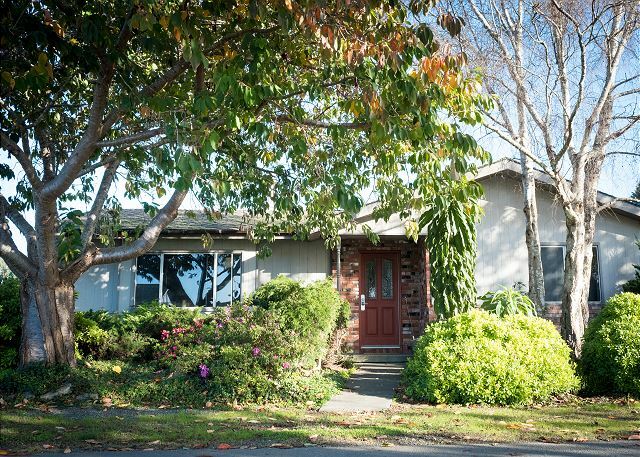 I had the good fortune to rent this place for several months while I transitioned to work at Humboldt State University. The place is great - comfortable and very near the light house and bay - great views. Don't forget to go to Seascape at the dock and Sunset at the casino - great places to eat. Management of the rental is great and responsive. I highly recommend this place - very charming. Half bath toilet leaks, so tank frequently refills. Full bath shower leaks hot water into tub. Gas BBQ needs cleaning since someone used charcoal in it. Internet sometimes intermittent. Otherwise the house was very nice. 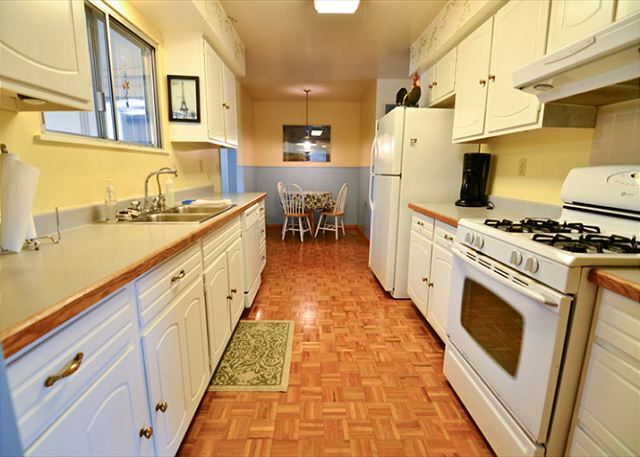 Dish washer, laundry, internet, plenty of space, not over-cluttered with knick knacks, etc. We ordered a new BBQ and have a new toilet coming in with the complete remodel of the half bath. Getting done by end of July 2011. Yes, have had some internet outages in town during your stay. Glad you enjoyed it! Overall the property was well-maintained; however, the trash bins were filled to overflowing the day we arrived (but were emptied within a day), and the floor in the living and dining rooms needed a good sweeping. Because these conditions are easily remedied, I would still give our stay a 5 overall. We were very comfortable, and there were plenty of clean linens, blankets, and towels to go around. We would happily stay there again. We have rented the Ocean Ave house for a week in June 2 years in a row. It's a very comfortable house with all the conveniences. We would highly recommend renting it. This house was perfect for us! I actually thought it was nicer than what the Youtube video showed. Thanks for a great weekend! 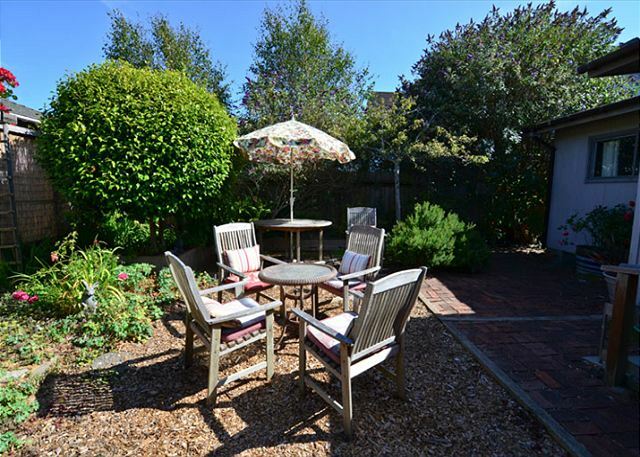 Beautiful property with quiet street, well kept landscaping and beautiful garden. The house had ample seating - two eating tables, two couches in the living room, and a separate sun room looking into the garden. The property was a very short walk to the bay view, and all else in Trinidad was also very close. A few additional furnishings would have made the stay one of our best: baking sheets or pans, hand towels in the bath, and glasses in the kitchen (those available were few and small). The city is great for watching the boats, beach waves, hiking the coast trail and fun small restaurants. The only site negative was the persistent fog. Most days in our August stay had clear views only for a few afternoon hours. That said, we'd gladly go back. Our stay at Trinidad village Retreat, on Ocean Ave, was very pleasant! The house is extremely comfortable; hardwood floors, fire-view stove, nice kitchen space, relaxing backyard & off street parking. The location is ideal, walking distant to local business, cute shops, wine tasting, the beach & Trinidad boat dock. We highly recommend renting! We all loved the property and location. The only things that I would suggest would be to buy at least 4 wine glasses. Property has none. More drink glasses. Property has 3. A few more coffee cups. Just so we don't have to wash cups every day. We worked around everything and it didn't take away from the experience. The house is lovely, in a great location close to simply everything. Sunroom is awesome, the backyard is beautiful: Love the teak chairs around the firepit, the flowers and vines, the sculptures, and the ambience. Spacious living room, great bedrooms, big eat-in kitchen (+ dining room!). All in all one of the very best stays we've had out of the dozen homes we've rented. The living room woodstove warmed us up delightfully (October stay) and was a real bonus. The hosts were way over the top, and anticipated and took care of our every need. Each day we felt like we were coming "home" when we returned to the house. This would be great for a single couple, two couples, a family, or a bunch of pals looking for a great getaway. Kudos to you and thanks for the great experience!!! A great location for just relaxing - which is just what we wanted! We had a great time and look forward to future visits. Yes, we had a wonderful time. The house was very nice. Convenient to everything.We would recommend you.You were also very cooperative and nice to work with. Thank you. Couldn't have been better ..
A perfect family environment ... comfortable beds and couches, plenty of linens, very easy access to health-conscious market. The yard was a pleasant area to sit down and relax. Everything in the kitchen was accessable, both for picky people and people who are 'vertically challenged'. What an escape for out-of-towners. Thank you so much! In the attitude of our Governator, I'll say "WE'LL BE BACK.."